Imagine if your vehicle offered technology to not only keep you connected on the road but also increased your confidence? The Ford Transit Passenger Wagon is a popular full-size passenger wagon that helps you achieve both. The Driver Alert system utilizes a camera mounted behind the windshield to determine vehicle position and detect lane departure. This feature works operates both during the day and night. Lane drifting is recognized as a sign of tiredness, and drivers will receive a visual and audio alert. Rain-sensing wipers turn on automatically and eliminate the driver's guesswork and adjust to their speed based on just how wet the windshield is. Those are just two technology features that help drivers navigate more safely. 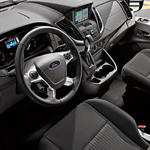 Our team in Kirkwood and Westport is excited about these and other technology features that the Ford Transit Passenger Wagon offers. We at Suntrup Ford would like to invite you to test drive a Ford Transit Passenger Wagon today.